If you have a completed or in-progress book- or chapbook-length poetry manuscript and you’re ready for some serious scrutiny, consider enrolling in the Colrain Poetry Manuscript Conference. Held at the Captain Whidbey Inn, in Coupeville, on Whidbey Island, Washington, September 25 – 28, 2015, the conference includes pre-conference assignments, workshops with intensive focus on manuscript preparation (selecting, ordering, revising, and swapping out poems) and meetings with press editors. Get more information on the Whidbey island Colrain Classic (there are three Colrain workshops each autumn in various locations), see what previous attendees have said, meet the conference faculty and review the conference criteria to see if it’s a good fit for you. Back in January, we posted about Poetry at Work Day. But those folks at Tweetspeak don’t want you to wait around until next year to celebrate again, so in May they introduced Poem on Your Pillow Day, and they’ve already started releasing materials for Take Your Poet to Work Day, July 15 (always the third Wednesday), including (so far) William Shakespeare, Maya Angelou, Robert Frost, and Anna Akhmatova. Of course, if these poets don’t ring your chimes, you can still download last year’s featured poets: Sylvia Plath, Christina Rossetti, W. B. Yeats, John Keats, Adrienne Rich, and Langston Hughes, or the 2013 poets: Emily Dickinson, Haiku masters, Pablo Neruda, Edgar Allan Poe, Rumi, T.S. Eliot, and Sara Teasdale. 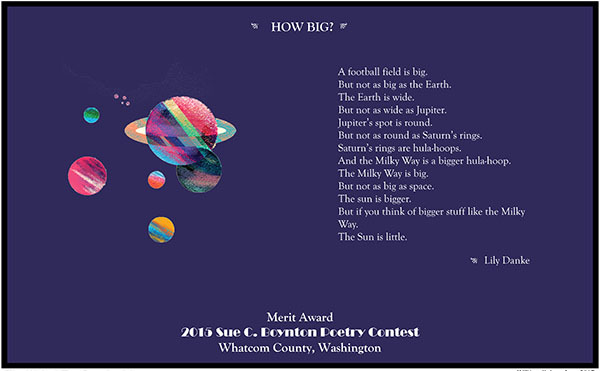 The idea is that you download (or create your own) image of a poet (hey, you’re a poet! ), print the image, color it, paste it to a stick or a pencil and bring it to work with you. Of course there are poems to go along with each poet’s image. Those fun folks at Tweetspeak also have a free coloring book (the 2014 version will be updated by July 8 to include the 2015 poets) and an infographic that explains it all. Enjoy! A football field is big. But not as big as the Earth. But not as wide as Jupiter. But not as round as Saturn’s rings. And the Milky Way is a bigger hula-hoop. The Milky Way is big. But not as big as space. But if you think of bigger stuff like the Milky Way. *Copyright 2015 by Lily Danke. Broadside illustrated by Mat Hudson. In connection with its “blockbuster exhibition,” “FRIDA KAHLO: Art, Garden, Life,” The New York Botanical Garden is currently displaying poems of 20th-century Mexican poet and Nobel Prize winner Octavio Paz (1914–1998), many referencing native plants and flowers. Co-presented with the Poetry Society of America, the Octavio Paz Poetry Walk is a continuation of the Garden’s Poetry for Every Season series. On Saturday, September 19, 2015, at 2:00pm, Poetry Walk curator Rachel Eliza Griffiths, whose work has been influenced by both Paz and Kahlo, will present a reading of selected poems in the Ross Hall. Paz’s poems will remain on view through November 1, 2015. If you’re looking to jump start your poetry this summer, what could be better than a one-day workshop? Hugo House in Seattle has an inspiring lineup, starting this Saturday, June 27, 2015, with Martha Silano teaching “Fixed Form Foray: Adventures with Formal Poetry.” See more one-day workshops, two-day workshops or browse the entire catalog.